We at Insider Monkey have gone over 700 13F filings that hedge funds and prominent investors are required to file by the SEC. The 13F filings show the funds’ and investors’ portfolio positions as of December 31st. In this article we look at what those investors think of Federal Realty Investment Trust (NYSE:FRT). Federal Realty Investment Trust (NYSE:FRT) was in 17 hedge funds’ portfolios at the end of December. FRT investors should pay attention to a decrease in hedge fund interest recently. There were 21 hedge funds in our database with FRT positions at the end of the previous quarter. 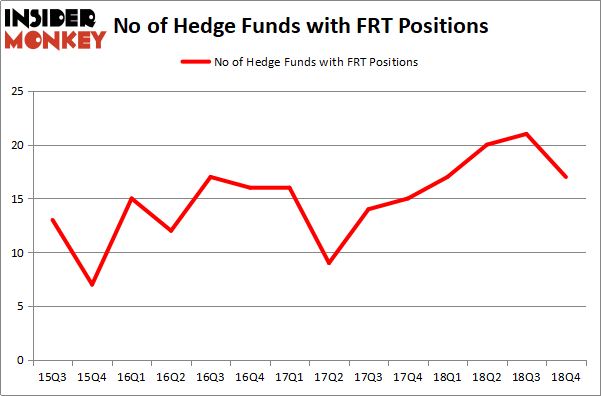 Our calculations also showed that FRT isn’t among the 30 most popular stocks among hedge funds. We’re going to go over the key hedge fund action surrounding Federal Realty Investment Trust (NYSE:FRT). What have hedge funds been doing with Federal Realty Investment Trust (NYSE:FRT)? Heading into the first quarter of 2019, a total of 17 of the hedge funds tracked by Insider Monkey were long this stock, a change of -19% from the second quarter of 2018. On the other hand, there were a total of 17 hedge funds with a bullish position in FRT a year ago. With the smart money’s positions undergoing their usual ebb and flow, there exists a select group of key hedge fund managers who were upping their holdings significantly (or already accumulated large positions). According to Insider Monkey’s hedge fund database, Jeffrey Furber’s AEW Capital Management has the biggest position in Federal Realty Investment Trust (NYSE:FRT), worth close to $74.3 million, accounting for 2.3% of its total 13F portfolio. Coming in second is Millennium Management, led by Israel Englander, holding a $48 million position; the fund has 0.1% of its 13F portfolio invested in the stock. Remaining hedge funds and institutional investors with similar optimism comprise Ken Griffin’s Citadel Investment Group, Clint Carlson’s Carlson Capital and Jim Simons’s Renaissance Technologies. Judging by the fact that Federal Realty Investment Trust (NYSE:FRT) has experienced bearish sentiment from hedge fund managers, logic holds that there is a sect of hedgies that decided to sell off their entire stakes in the third quarter. Intriguingly, Eduardo Abush’s Waterfront Capital Partners said goodbye to the largest position of the 700 funds followed by Insider Monkey, comprising an estimated $8 million in stock, and Glenn Russell Dubin’s Highbridge Capital Management was right behind this move, as the fund said goodbye to about $5.1 million worth. These bearish behaviors are intriguing to say the least, as aggregate hedge fund interest was cut by 4 funds in the third quarter. Let’s go over hedge fund activity in other stocks similar to Federal Realty Investment Trust (NYSE:FRT). We will take a look at Equity Lifestyle Properties, Inc. (NYSE:ELS), Mohawk Industries, Inc. (NYSE:MHK), Newell Brands Inc. (NASDAQ:NWL), and New Oriental Education & Tech Group Inc. (NYSE:EDU). All of these stocks’ market caps resemble FRT’s market cap. As you can see these stocks had an average of 25.5 hedge funds with bullish positions and the average amount invested in these stocks was $1067 million. That figure was $235 million in FRT’s case. Mohawk Industries, Inc. (NYSE:MHK) is the most popular stock in this table. On the other hand Equity Lifestyle Properties, Inc. (NYSE:ELS) is the least popular one with only 15 bullish hedge fund positions. Federal Realty Investment Trust (NYSE:FRT) is not the least popular stock in this group but hedge fund interest is still below average. This is a slightly negative signal and we’d rather spend our time researching stocks that hedge funds are piling on. Our calculations showed that the top 15 most popular stocks among hedge funds returned 21.3% through April 8th and outperformed the S&P 500 ETF (SPY) by more than 5 percentage points. Hedge funds were also right about betting on FRT, though not to the same extent, as the stock returned 17.7% and outperformed the market as well. Were Hedge Funds Right About Flocking Into Altice USA, Inc. (ATUS) ? Were Hedge Funds Right About Souring On WestRock Company (WRK) ? 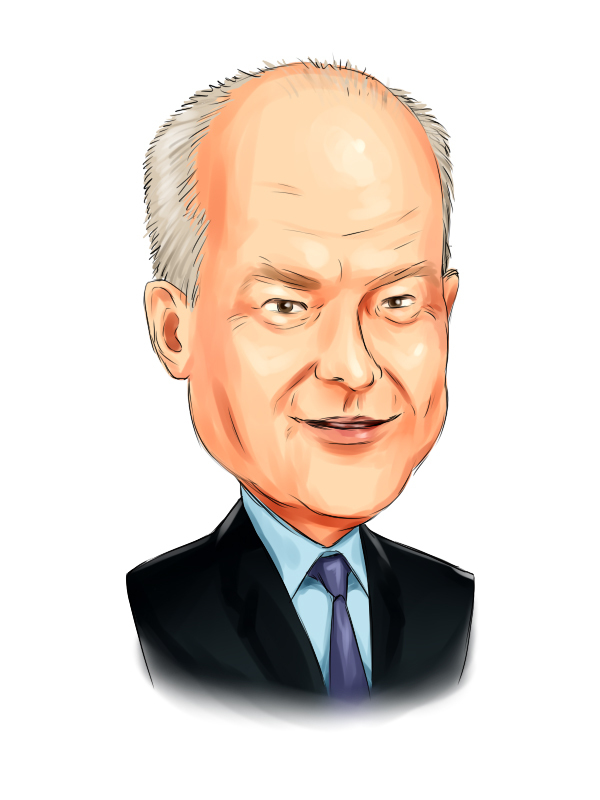 Here is What Hedge Funds Think About Jack Henry & Associates, Inc. (JKHY... Here’s What Hedge Funds Think About The Gap Inc. (GPS) Here’s What Hedge Funds Think About IDEX Corporation (IEX) Did Hedge Funds Drop The Ball On Kansas City Southern (KSU) ?